Do Hedge Funds Love State Street Corporation (STT)? Before we spend days researching a stock idea we’d like to take a look at how hedge funds and billionaire investors recently traded that stock. S&P 500 Index ETF (SPY) lost 8.7% through October 26th. Forty percent of the S&P 500 constituents were down more than 10%. The average return of a randomly picked stock in the index is -9.5%. This means you (or a monkey throwing a dart) have less than an even chance of beating the market by randomly picking a stock. On the other hand, the top 25 most popular S&P 500 stocks among hedge funds had an average loss of 8.8%. In this article, we will take a look at what hedge funds think about State Street Corporation (NYSE:STT). State Street Corporation (NYSE:STT) shareholders have witnessed a slight decrease in enthusiasm from the smart money in recent months. However, while State Street didn’t come close to making our list of the 30 Most Popular Stocks Among Hedge Funds, it did land in the 20th and final spot on our countdown of 20 Dividend Stocks That Billionaires Are Piling On, thanks to a dividend yield that has pushed past 2.50% in the past couple of months. According to most shareholders, hedge funds are perceived as slow, old financial vehicles of years past. While there are over 8,000 funds trading at present, We hone in on the aristocrats of this club, around 700 funds. 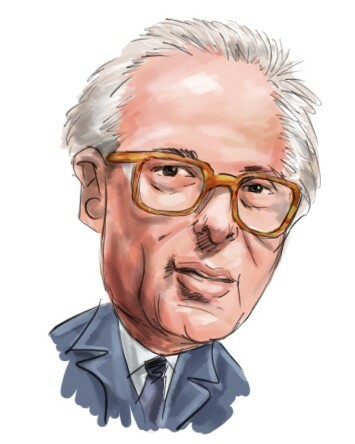 Most estimates calculate that this group of people command the lion’s share of the hedge fund industry’s total capital, and by shadowing their finest investments, Insider Monkey has unsheathed numerous investment strategies that have historically defeated Mr. Market. Insider Monkey’s flagship hedge fund strategy beat the S&P 500 index by 6 percentage points annually since its inception in May 2014 through early November 2018. We were able to generate large returns even by identifying short candidates. Our portfolio of short stocks lost 26.1% since February 2017 even though the market was up nearly 19% during the same period. We just shared a list of 11 short targets in our latest quarterly update. What does the smart money think about State Street Corporation (NYSE:STT)? Heading into the fourth quarter of 2018, a total of 35 of the hedge funds tracked by Insider Monkey held long positions in this stock, a 3% dip from the previous quarter. By comparison, 35 hedge funds held shares or bullish call options in STT heading into this year, so sentiment has remained flat in 2018. So, let’s find out which hedge funds were among the top holders of the stock and which hedge funds were making big moves. More specifically, Millennium Management was the largest shareholder of State Street Corporation (NYSE:STT), with a stake worth $142.8 million reported as of the end of September. Trailing Millennium Management was AQR Capital Management, which amassed a stake valued at $123 million. Balyasny Asset Management, Appaloosa Management LP, and Citadel Investment Group were also very fond of the stock, giving the stock large weights in their portfolios. Due to the fact that State Street Corporation (NYSE:STT) has witnessed falling interest from the smart money, it’s safe to say that there exists a select few money managers that elected to cut their positions entirely last quarter. It’s worth mentioning that Clint Carlson’s Carlson Capital cut the largest position of all the hedgies monitored by Insider Monkey, valued at an estimated $40 million in stock. Robert B. Gillam’s fund, McKinley Capital Management, also sold off its stock, about $23.3 million worth. These moves are interesting, as total hedge fund interest fell by 1 funds last quarter. 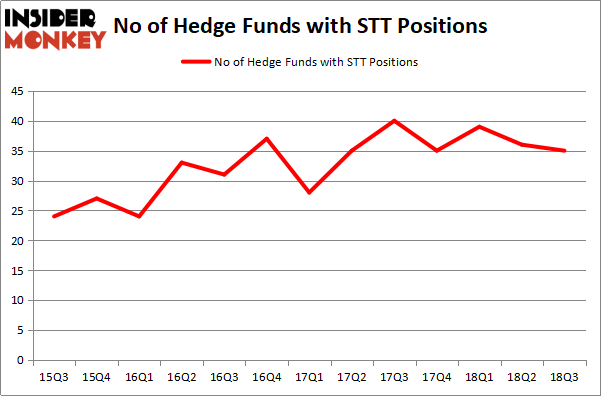 Let’s also examine hedge fund activity in other stocks similar to State Street Corporation (NYSE:STT). We will take a look at Workday Inc (NYSE:WDAY), Worldpay, Inc. (NYSE:WP), Fresenius Medical Care AG & Co. KGaA (NYSE:FMS), and Align Technology, Inc. (NASDAQ:ALGN). This group of stocks’ market valuations are closest to STT’s market valuation. As you can see these stocks had an average of 33 hedge funds with bullish positions and the average amount invested in these stocks was $1.73 billion. That figure was $1.27 billion in STT’s case. Worldpay, Inc. (NYSE:WP) is the most popular stock in this table. On the other hand Fresenius Medical Care AG & Co. KGaA (NYSE:FMS) is the least popular one with only 6 bullish hedge fund positions. State Street Corporation (NYSE:STT) is not the most popular stock in this group but hedge fund interest is still above average. This is a slightly positive signal but we’d rather spend our time researching stocks that hedge funds are showing recent hedge fund bullishness, like WP.